Last week I gave my best shot at defining what is “social video marketing.” In today’s article, I showcase 5 examples from companies that I think are meeting that definition. These examples are doing social video marketing not just for sales and visibility, but because it reflects an important part of their own business model and business culture. Home Monitoring – Security Cameras – View your home LIVE on the internet! I liken this article to going out to dinner tapas-style – 5 big appetizers that make up a tasty dish on social video marketing. I’ve kept the information short for each numbered example; and I have included a small, embedded video where feasible, along with a link to any existing article for more information, entrée-style. I’m not getting into what examples or business models are proven business successes, because those could all be individual articles in themselves. Instead I want to start you off with an idea of what’s possible, so we can see how this newly-defined marketing niche we call social video marketing is beginning to take shape. I consider BlendTec to be one of the very early pioneers of social video marketing. Their “Will It Blend?” claim to fame is showcasing all the ways that their retail and commercial blenders can blend things you would never likely see in any television commercial. All the possibilities they have come up with are on their YouTube Channel. It has been going strong since 2006, and some of their more popular videos (they’re very good about covering the latest gadgets or pop culture products) have amassed over 10 million viewers individually! Their videos are hilarious with a 60’s-kitch soundtrack; they have solid production, creative writing, and a concise video length. Also the company’s own founder, Tom Dickson, appears as the host of every video to show off the power of his blender. Want more of this topic? Watch my interview with Blendtec’s George Wright, former VP of Marketing and Sales who came up with the BlendTec video marketing strategy. ScanCafe, the scanning service used by pro photographers and Pulitzer Prize winners. It’s available to you from just 35 cents an image. This edgy-but-compassionate Midwestern evangelical pastor and author recently put out a religious book titled, “Love Wins – A Book About Heaven, Hell, and the Fate of Every Person.” Even before his book released on March 15th of this year, the buzz from his promotional YouTube video helped generate lots of mainstream media attention, and skyrocketed the book to #6 on Amazon.com’s best sellers’ list. If you do a search on YouTube and Google Video, you’ll see that Bell has been doing social video for many years. I liken Rob’s style to an attraction for “tipping sacred cows,” which he manages to express in a way that’s both palatable enough to both his target market as well as people outside his evangelical circles, who are attracted to both his message and the creative ways he expresses it with both social media and online video. Social video marketing isn’t only about creating entirely positive new experiences for customers. Sometimes it involves demonstrating responsibility when you make mistakes, and a way to make amends. Domino’s USA’s Pizza Apology Video featuring their CEO was an excellent way to respond to the Domino’s Prank Video posted on YouTube back in 2009. However to turn a big negative into a positive for sales, what they had to do was build on the original apology and show a strong, continued effort to follow up with videos directly. So the following year in 2010, Domino’s launched the “Show Us Your Pizza” contest website, featuring Domino’s USA’s own head chef inserted into actual user-submitted videos of people’s pizza experiences with Domino’s. (One video I particularly enjoy is where the head chef personally delivers a new pizza directly to a customer who got a botched order, and he interviews the actual customer about his whole experience, right at the guy’s dinner table.) Domino’s YouTube channel and their Show Us Your Pizza website are great examples of how to turn a big negative into a big positive using video. They combined an apology with a remedy, engaged with their customers, and empowered them in a fun way. Each episode is hosted by Google’s senior software engineer Matt Cutts, who has worked for them since 2000 and is in charge of enforcing the Google Webmaster Guidelines; and whom I’ve personally known since 2002. Each of the videos is done with stellar audio and video quality, with a simple yet well-light solid color backdrop that varies between episodes. Users are encouraged to submit questions for future videos, and Matt always announces the name of the submitter in the beginning (where both the name and question are featured as a clear text graphic). It’s a great example of how any individual question can be a great opportunity to respond to in a video, that is very easily shared with people who have the same question. Want more of this topic? 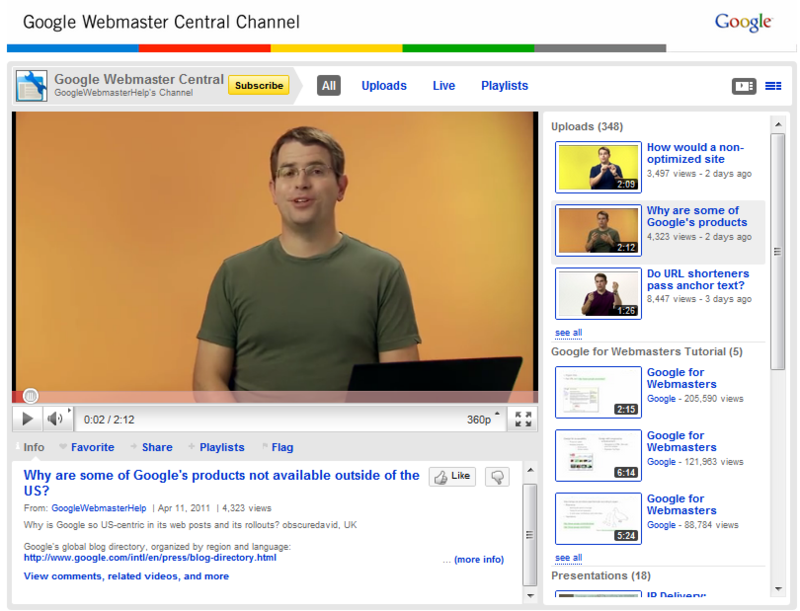 Read the Google Webmaster Central Blog post with their introduction of the YouTube channel. Zappos is a retail shoe company that embodies social video marketing deep into its business culture. Their own staff showcases all of their products by holding them in their hands to present them directly to the camera. “We get a lot of customer feedback on our YouTube channel and prior to having tracking, we used this as a way to gauge how well our videos were received. We used google’s fancy analytics as a starting point for how long our videos should be, where most of our customers were located, what kind of videos they were interested in, etc.” Zappos also has a YouTube channel called The Zappos Experience, created for their customers to submit their own video to Zappos with their feedback and questions. Zappos plans on shooting a video for all incoming new products this year. That turns out to be around 100,000 new videos. They have 19,000 videos indexed on google. They offer social media share (Facebook, Twitter, blog) icons on all product videos. Their recent addition of a video button (and text graphic “video”) shot up their website video views from 20,000 video hits a day to 160,000 – an 800% increase. Want more of this topic? Check out my article and video interview with Zappos’ Laurie Williams, taken at the Liveclicker Video Commerce Consortium Summit in July 2010. This is a very small sampling of companies that are doing social video marketing that I think we can also learn a lot from and implement in own marketing and ecommerce efforts. I’m looking forward to exploring much more of online space and showing more examples of companies today that are “getting social” with their video marketing communications. It should help us all learn how to better combine the technology, media, and creative culture needed to build better business relationships with our customers and colleagues while driving results.